This herb is the dried bark of Phellodendron chinense Schneid. or Phellodendron amurense Rupr. (Fam. Rutaceae). The former is commonly called Chuan Huang Bai and the latter is called Guan Huang Bai. Chuan Huang Bai is produced chiefly in the provinces of Sichuan, Guizhou, Hubei, and Yunnan. Guan Huang Bai is produced chiefly in the provinces of Liaoning, Jilin, and Hebei. The bark is stripped off the tree from March to June, dried in sunlight, sliced, and used unprepared or stir-baked with salt water. Meridians: Kidney, urinary bladder and large intestine. 1. Damp-heat syndrome: a) damp-heat accumulated in intestines manifested as diarrhea and dysenteryPhellodendron bark (Huangbai) is used with Pulsatilla root (Baitouweng), Coptis root (Huanglian) and Scutellaria root (Huangqin); b) internal accumulation of damp-heat manifested as jaundicePhellodendron bark (Huangbai) is used with Capejasmine (Zhizi) and Oriental wormwood (Yinchenhao); c) downward flowing of damp-heat, turbid urination and yellow, thick leukorrheaPhellodendron bark (Huangbai) is used with Plantain seed (Cheqianzi), Bamboo leaf (Zhuye) and Clematis stem (Mutong); d) boils caused by dampness in the lower part of the bodyPhellodendron bark (Huangbai) is used with Atractylodes rhizome (Cangzhu). 2. General boils, carbuncles, furuncles and eczema. Phellodendron bark (Huangbai) is used with Scutellaria root (Huangqin) and Capejasmine (Zhizi). For external use, Phellodendron bark (Huangbai) is pounded into a powder mixed with Talc (Huashi). 3. Deficiency of yin with heat manifested as noturnal emissions and night sweating. 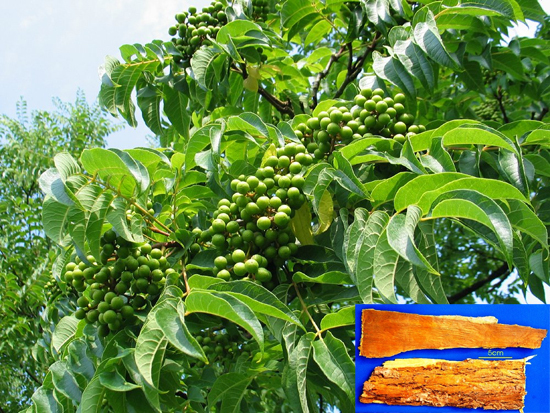 Phellodendron bark (Huangbai) is used with Anemarrhena rhizome (Zhimu) and Fresh rehmannia root (Shengdihuang). 4. For fever with night sweats and seminal emission due to Yin Deficiency, it is used with Rhizoma Anemarrhenae (Zhi Mu), Radix Rehmanniae (Sheng Di Huang), and Carapax et Plastrum Testudinis (Gui Ban) in “Rehmmania Bolus of Six Herbs Plus Anemarrhena and Phellodendron” (Zhi Bai Di Huang Wan). Dosage: 3-10 g, decocted in water for an oral use, or used in bolus and powder. Appropriate quantity for external use. Cautions & Contraindications: This herb is very bitter and cold, and easily damages the Stomach Qi, therefore it is contraindicated for Cold syndromes of a Deficiency type in the Spleen and Stomach.